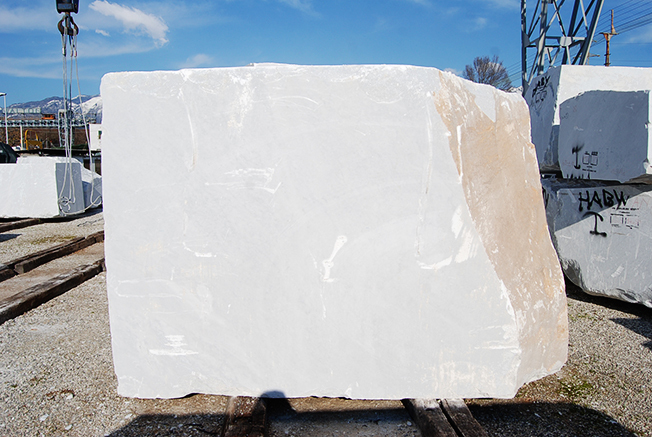 This is a recent picture of my marble sculpture Selene – a public commission in Newport News, Virginia. She lives in Kettle Pond, which, as you can see, froze this year. You can find out more information about the Newport News Public Art Foundation, on their webpage, linked here. Thanks to Jerry Gammon for sending the photograph, and for his continuous interest in and love for Selene. Visit Jerry’s website, linked here. This is my most recent sculpture commission – I’m happy to share with you pictures of “Sun Worshipper” in her new home. The bronze sculpture was cast by the Mariani Foundry in Pietrasanta. This sculpture has travelled further than any of my other sculptures taking her all the way to Kuala Lumpur. I would like to thank my gracious client for the commission, the lovely presentation – and the photographs. 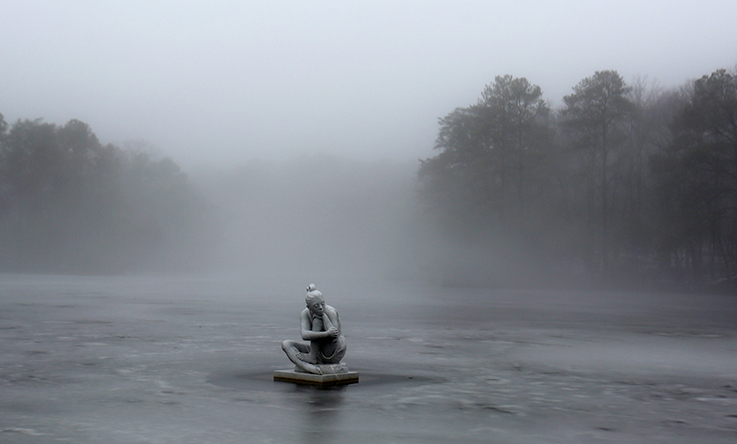 “Selene” rests on Kettle Pond in Newport News surrounded by ice and fog early Wednesday morning. The 7-foot, 8,455-pound figure was sculpted by Italian artist Maria Gamundi, photograph by Adrin Snider. 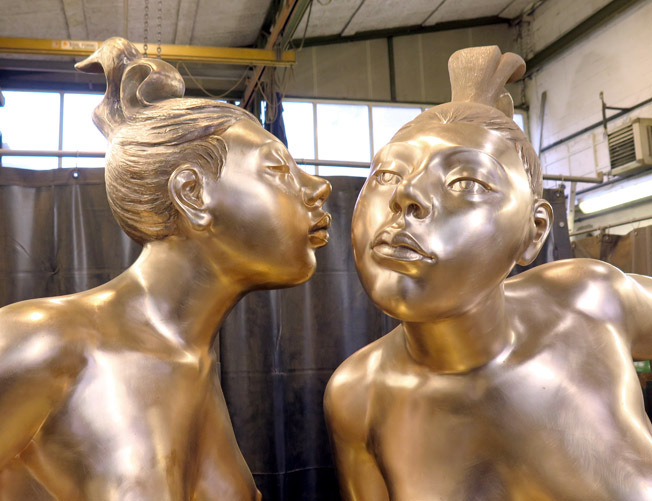 I posted previously about “The Gossipers” – one of my monumental bronze sculptures which I produced at the Mariani Foundry in Pietrasanta, and you can read about it and see pictures by clicking here. These are photos of the private commission in its final location. 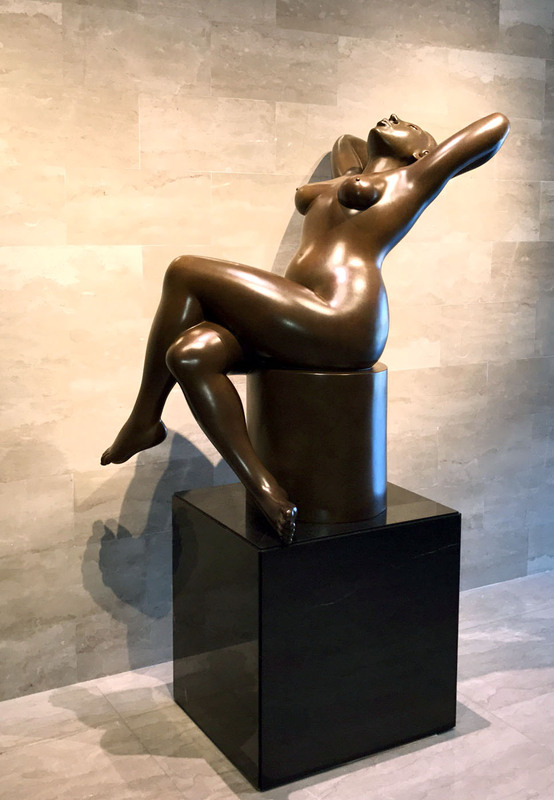 I have several monumental bronze sculptures in private collections in the United States, England, the Netherlands, Italy and elsewhere. I get great satisfaction from seeing my works in their new homes, because they take on a new life – it is always amazing to me to see how naturally they sit in their new settings, as if they’d always been there. The photos are by Rafael Rodriguez. 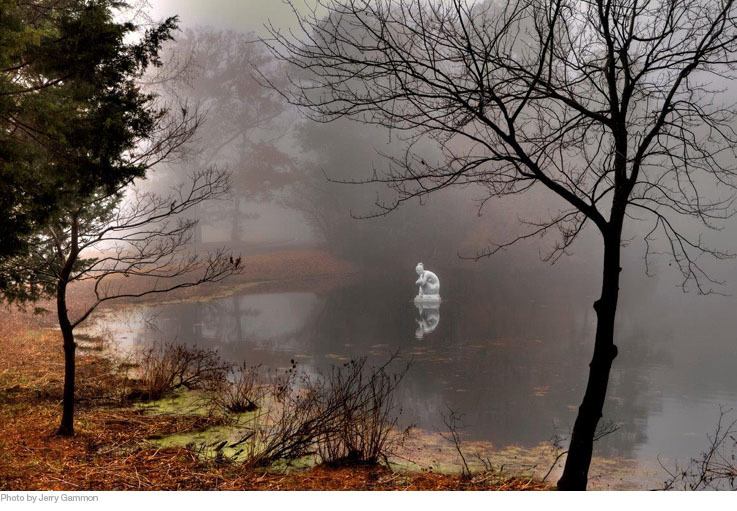 Here is a magical photograph of “Selene” under the full moon, in her home at Kettle Pond, Virginia. 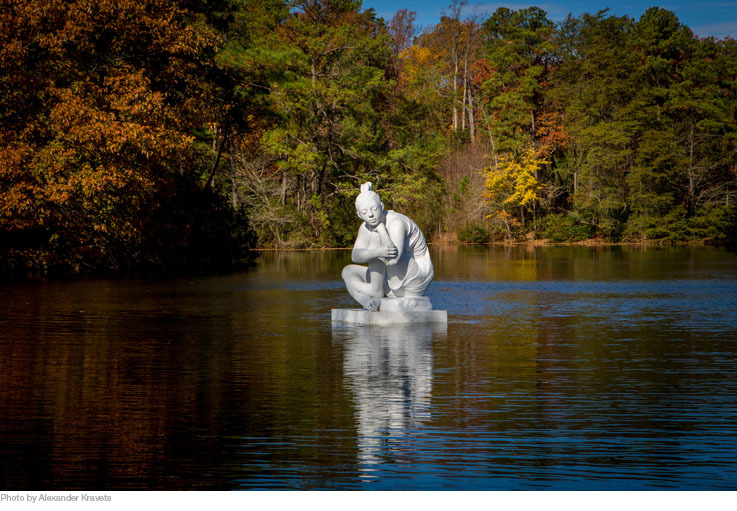 The sculpture, made of Carrara marble, is a commission by the Newport News Public Art Foundation, and was carved in Pietrasanta. Here is a quick glance at one of my bronze sculpture – in progress. It’s a rare chance to see the work without the final patina, which the capable artigiani at the Mariani Bronze Foundry in Pietrasanta – where the piece was cast – will apply. Without the patina one can see the fine craftsmanship that the artisans are able to achieve. You can visit the Mariani Foundry website, linked here. “The Gossipers” is my playful meditation on two figure’s relationship with each others and the space between them. It nearly 2 meters tall and is a private commission. You can visit my website to see more pictures of my work, linked here. 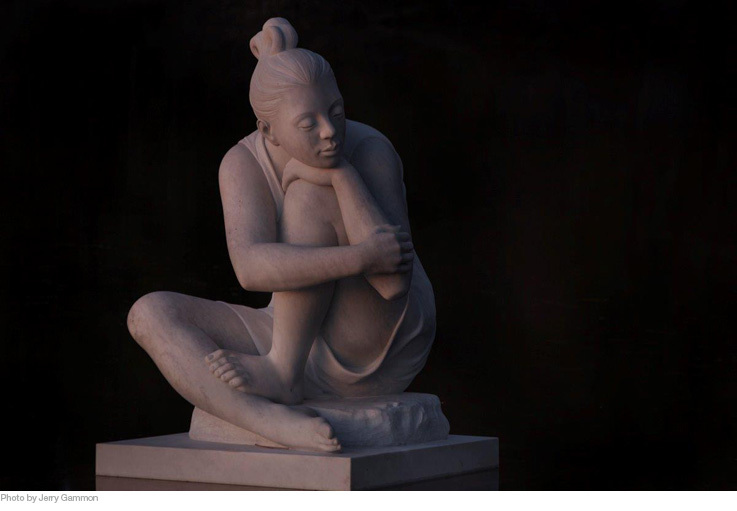 “Selene” – a sculpture I made out of Carrara Marble, in Pietrasanta – is a source of inspiration for the community and for professional photographers. 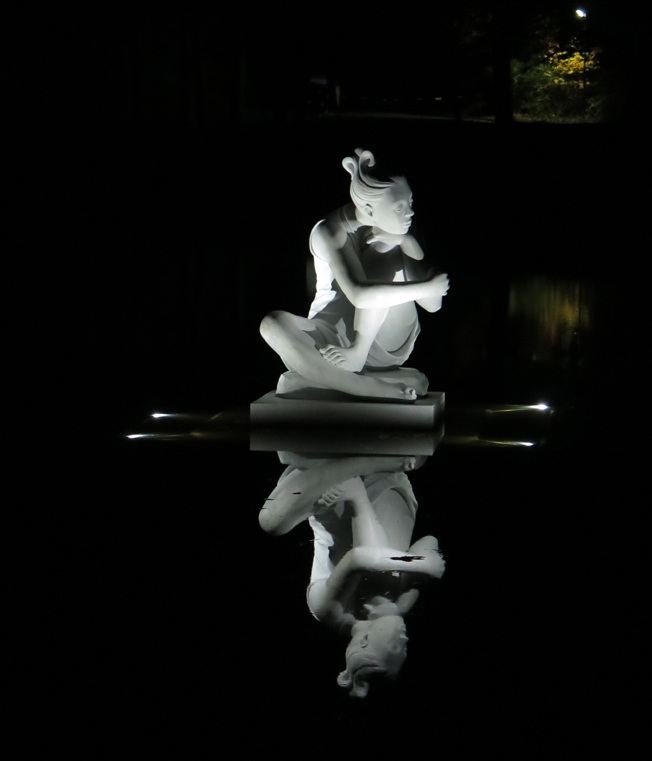 Above are a few photographs of “Selene” in its new home at Kettle Pond, Mariners’ Museum Park, Newport News, Va.
A dream come true: after three years of work, my “Selene” – made in white Carrara marble – rests serene reflecting her image on the waters of Kettle Pond, as she gazes on the James River. I was thrilled and honored to work with the Newport News Public Art Foundation on this commission. I had the pleasure to be present for the public unveiling – which took place on the 23rd of November, 2013. At the ceremony, which took place on a beautiful sunny fall day, I met some wonderful people. Present were also city council members, McKinley L. Price the city’s Mayor, City Manager, Jim Bourey, State Sen. John Miller, and City Development Director Florence Kingston. Vice Mayor Herbert H. Bateman Jr. and Elliot Gruber, President of The Mariners’ Museum spoke to the crowd. Bobby Freeman Chairman of the Newport News Public Art Foundation kicked-off the ceremony. “Selene” is now part of the Newport News community; visitors can call a number, while at the park, and hear a short introduction in my own voice. 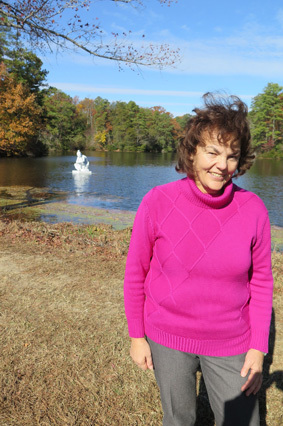 I’d like to give a warm thank you to Bobby Freeman, the Chairman of the Newport News Public Art Foundation, who was able to envision the finished sculpture on the pond, and whose love of art enriches the lives of so many, and Carol Capó, the Foundation Executive Director, who helped orchestrate the project, and to all the donors who so generously gave to fund the making of “Selene.” I’d also like to thank the folks back home – in Pietrasanta, Italy – for their help and support: Nicola Stagetti and his able artisans who helped in the realization, and Valentina Fogher in the city’s Cultural Office, as well as Pietrasanta’s Mayor Domenico Lombardi for their continued support. UPDATE: Celebrating the completion of “Selene” with a toast at the Studio Stagetti, this Saturday, September 7th at 6pm – you are all invited! Work on “Selene,” my commission for the Newport News Public Art Foundation is finished. 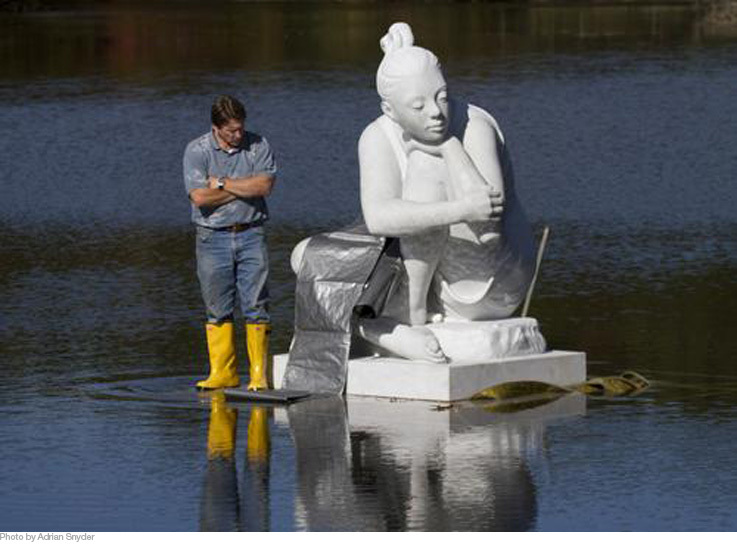 The statue is 138cm x 133cm x 220cm, weighing nearly four tons. 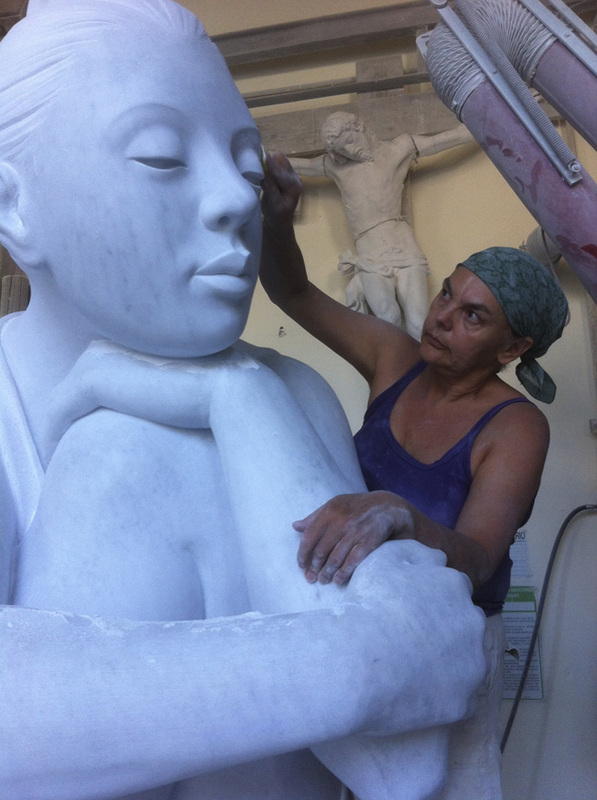 I will be celebrating its completion with my fellow workers – some of Pietrasanta’s famed Artigiani who work at the Studio Stagetti, who helped me in the realization of the piece. I extend the invitation to you, dear readers, to come and toast with me. The event takes place this Saturday, the 7th of September at 6pm at the Studio Stagetti. 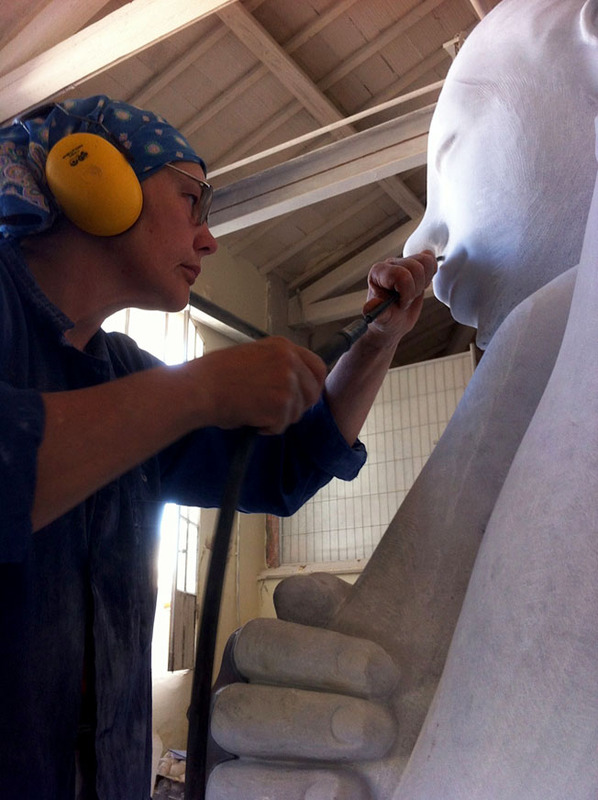 Silvano Cattai, a Pietrasanta-based sculptor, has been documenting my progress on “Selene” and took the photo above. In it you can see me sanding and perfecting the surface of the marble. We are getting close to being finished! 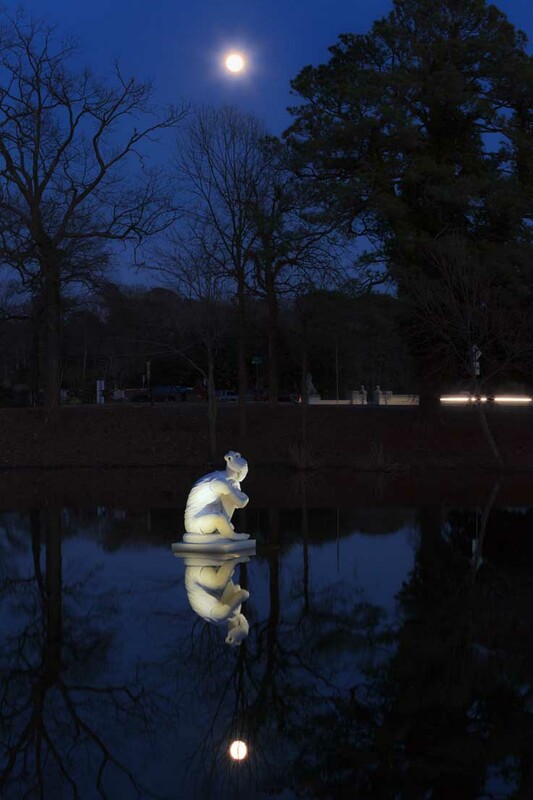 “Selene” is a commission for The Newport News Public Art Foundation. 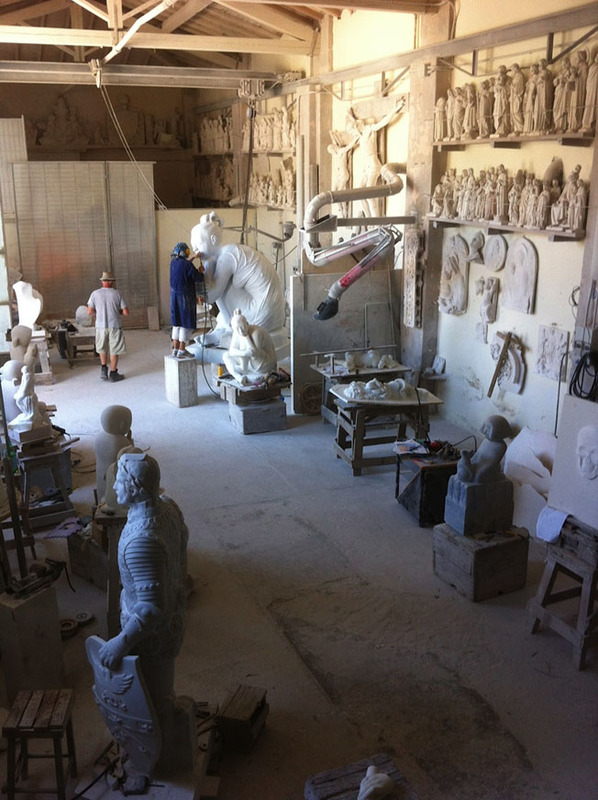 The work is taking place at Studio Stagetti, one of the marble studios of Pietrasanta. Here are photos of me working on “Selene,” my Carrara marble sculpture, which was commissioned by The Newport News Public Art Foundation. To find out more information about the studio, visit the studio website, linked here. I’ve been working on the plaster model (which is 1 meter tall) of my sculpture “Selene” – which has been commissioned by the Newport News Public Art Foundation. 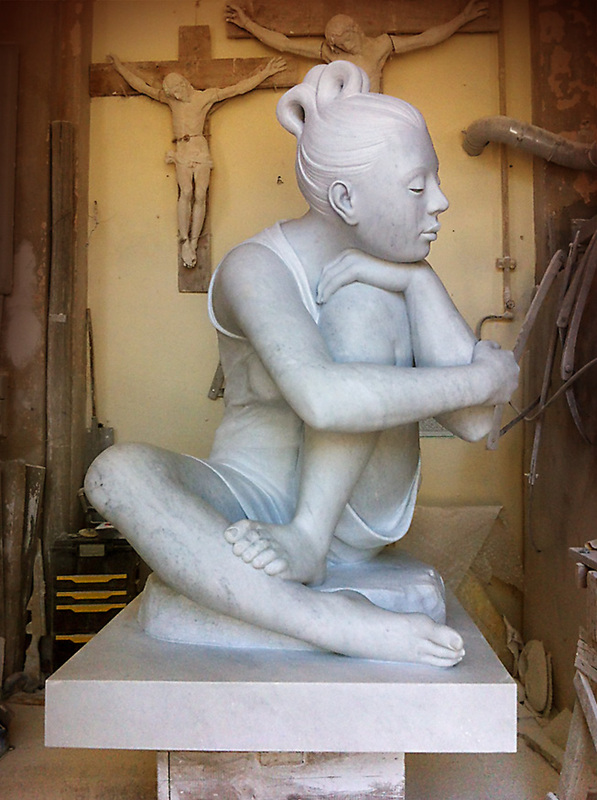 The model is finished, and ready to be used for the carving of the 2,20 meter white Carrara marble sculpture, which I will produce here in Pietrasanta. Here to the side you can see a picture of me putting the finishing touches on the plaster model; above, you can see a picture of the white Carrara marble block that I selected for the sculpture. This is always a thrilling moment in the process – I can’t wait to start! Stay tuned for more photos as the sculpture progresses. I’m new to blogging and am interested in hearing your thoughts, dear reader. Feel free to drop me a line in the comments section below this post. 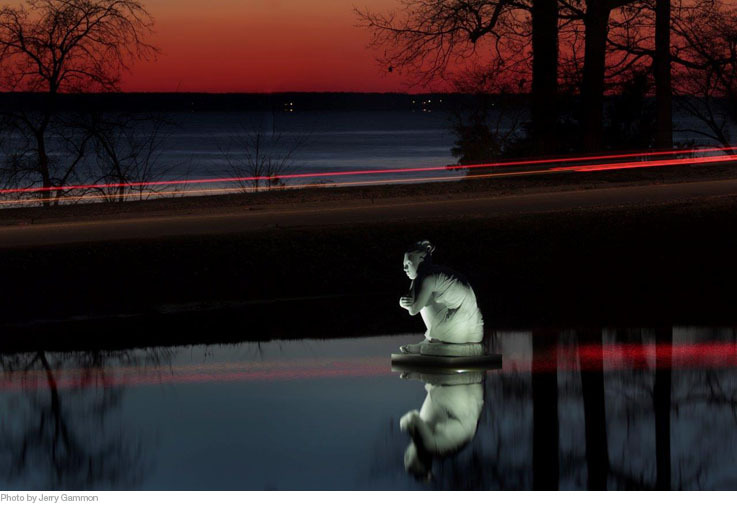 Newport News Public Art Foundation is sponsoring Maria Gamundi’s “Selene” which is to be installed in Kettle Pond, gazing out over the James River. 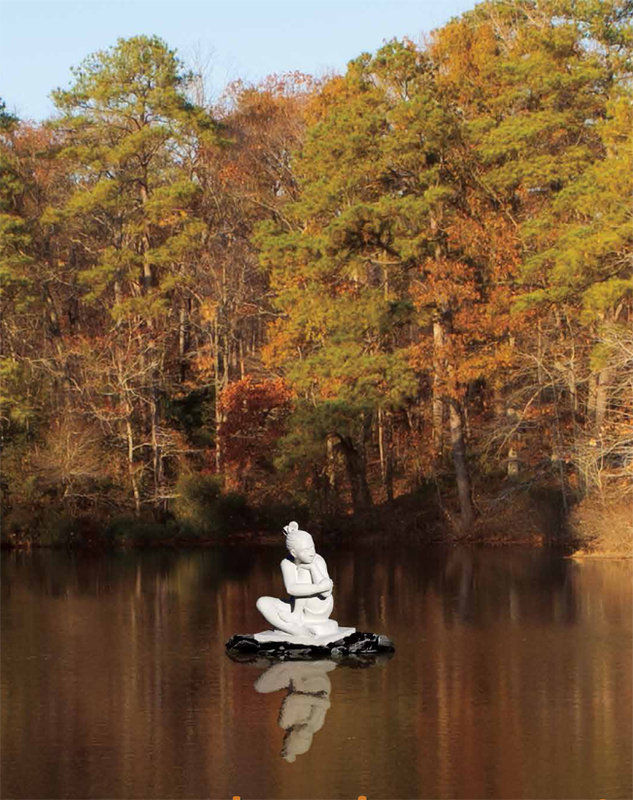 The photo above is a photo-montage of a plaster model of “Selene” in the setting of Kettle Pond, Newport News, Virginia. 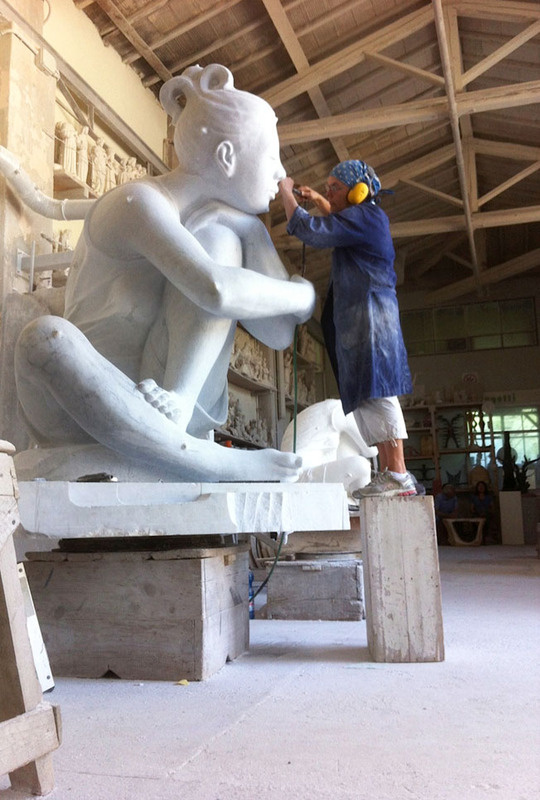 The final sculpture will be two-meters-high and will be carved out of white Carrara marble. 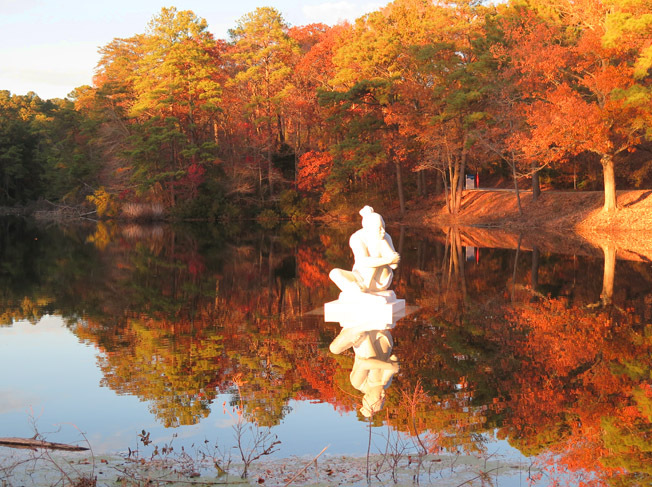 The Newport News Public Art Foundation supports art in public spaces around the city. You can learn more about the sculptures in public spaces sponsored by NNPAF, and “take a tour” on their website, linked here. They are committed to showcasing artworks in public spaces as they believe this affords people a chance to “live” with the art – and art is viewed, in this way, more than art exhibited in museums. I am delighted by this commission, and am already working on the project. 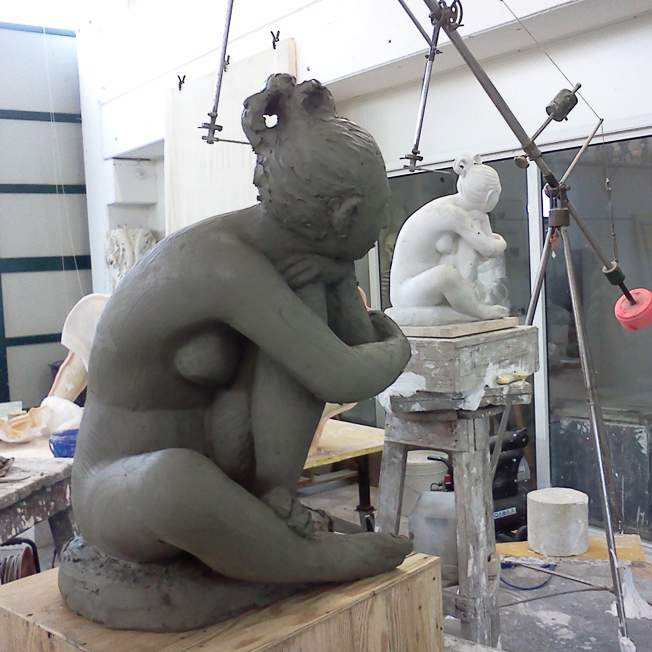 I am currently creating a one-meter-high clay model which will serve for the carving, in marble, of the final sculpture. The Armature. 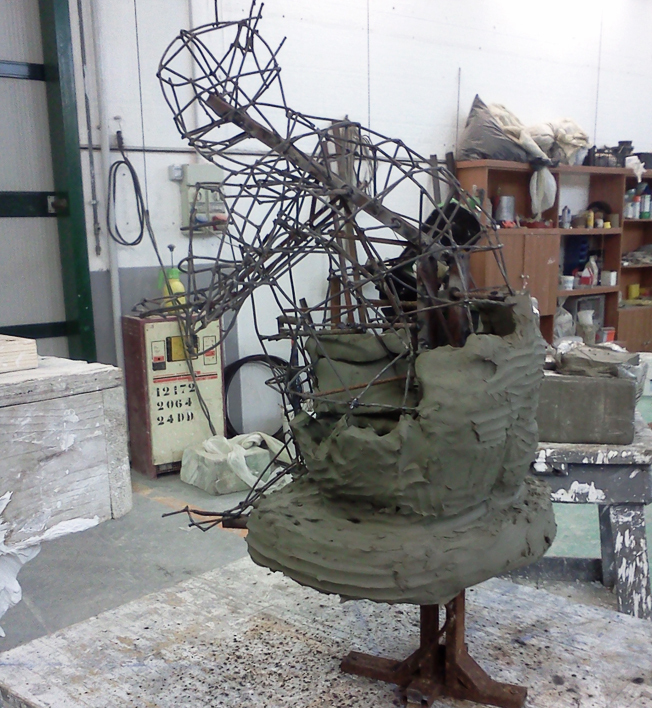 In this photo you can see the iron armature being covered with the first layer of clay. Working the Clay Model. 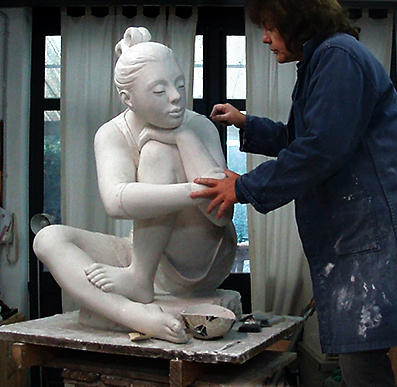 This is me working on the clay model in my studio in Pietrasanta; this is my chance to perfect and re-create the sculpture in this new size. The enlargement of any work creates issues that affect the whole. I look at each element and make sure that it is harmonious and balanced. The project, of bringing “Selene” to Newport News is funded entirely by donations from the community. If you would like to contribute, call (757) 369-3014, or email ccapo@nnpaf.org. 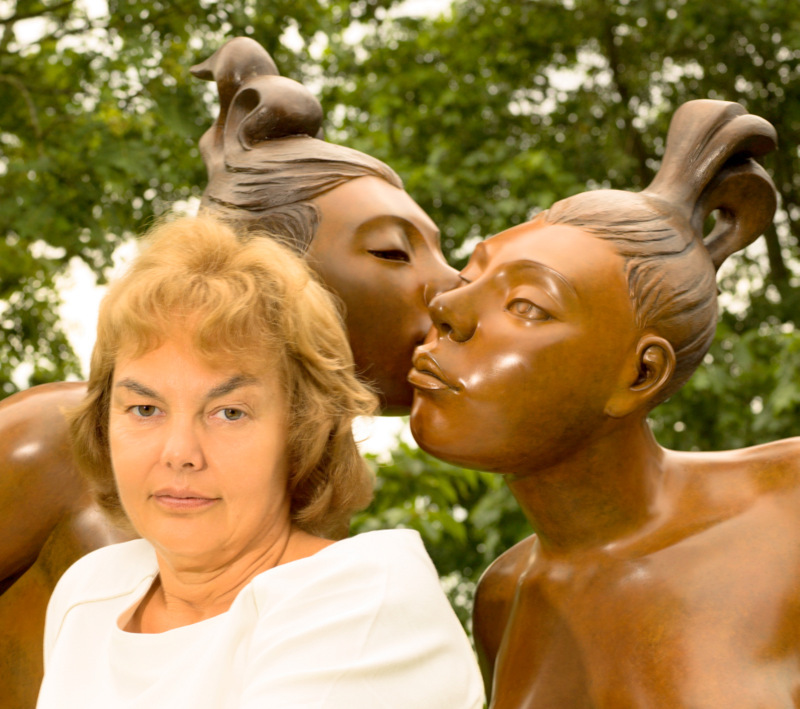 Visit the Newport News Public Art Foundation website, linked here.